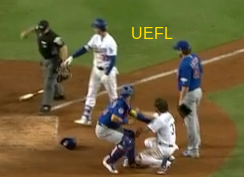 2B Umpire Mike Winters ejected Cubs Manager Joe Maddon for arguing a Replay Review decision that overturned HP Umpire Lance Barksdale's collision violation no-call in the bottom of the 7th inning of the Cubs-Dodgers game. With one out and two on (R1, R2), Dodgers batter Justin Turner hit a 1-0 fastball from Cubs pitcher John Lackey on a ground ball to left fielder Kyle Schwarber, who threw to catcher Willson Contreras as Dodgers baserunner R2 Charlie Culberson slid toward home plate, ruled out by HP Umpire Barksdale. Upon Replay Review as the result of a Manager's Challenge by Dodgers Manager Dave Roberts, Barksdale's ruling was overturned to "safe" pursuant to HP Collision/plate blocking Rule 6.01(i)(2), the call was correct. * At the time of the ejection, the Dodgers were leading, 5-2. The Dodgers ultimately won the contest, 5-2. This is Mike Winters (33)'s second ejection of 2017. Mike Winters now has 6 points in the UEFL Standings (3 Prev + 2 MLB + 1 Correct-Crewmate = 6). Crew Chief Mike Winters now has 8 points in Crew Division (7 Previous + 1 Correct Call = 8). *OBR 6.01(i)(2) states, "Unless the catcher is in possession of the ball, the catcher cannot block the pathway of the runner as he is attempting to score. If, in the judgment of the umpire, the catcher without possession of the ball blocks the pathway of the runner, the umpire shall call or signal the runner safe. Not withstanding the above, it shall not be considered a violation of this Rule 6.01(i)(2) (Rule 7.13(2)) if the catcher blocks the pathway of the runner in a legitimate attempt to field the throw (e.g., in reaction to the direction, trajectory or the hop of the incoming throw, or in reaction to a throw that originates from a pitcher or drawn-in infielder)." *OBR 6.01(i)(2) Comment states, in part, "A catcher shall not be deemed to have hindered or impeded the progress of the runner if, in the judgment of the umpire, the runner would have been called out notwithstanding the catcher having blocked the plate." *This is the 13th Replay Review of a HP Collision play in 2017, and first overturned call. This is the 186th ejection report of 2017, 2nd of the postseason. This is the 88th Manager ejection of 2017. This is Chicago-NL's 6th ejection of 2017, T-1st in the NL Central (CHC, CIN, MIL, PIT 6; STL 4). This is Joe Maddon's 3rd ejection of 2017, 1st since August 16 (Chris Conroy; QOC = Y [Check Swing]). This is Mike Winters' 2nd ejection of 2017, 1st since May 20 (Bob Melvin; QOC = Y [Base Award]).